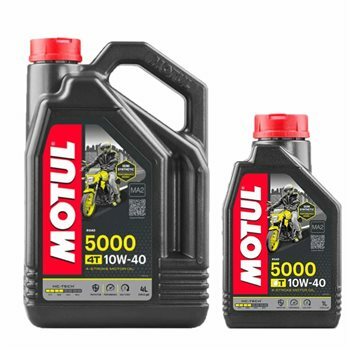 Motul 5000 4T 10w-40 is a semi-synthetic motorcycle engine oil reinforced with hydrocracked basestocks to ensure engine protection and improve gear lifetime. Suitable for street and road bikes, trails, off-road bikes fitted with 4 stroke engines, integrated gearbox or not, wet or dry clutch, engines meeting Euro 2 or Euro 3 emission regulation, fitted with exhaust gas after treatment systems : catalytic converters, air injection into exhaust pipe. Meets JASO MA2 Specifications for optimal wet clutch performance. Oil change: according to manufacturers' requirements and to be adjusted according to particular use. Good quality oil and fantastic value for the 4 litre.